Hood poppers, also known as durable dot fasteners. Universal fastener for car hoods, tonneaus, spray decks etc. Factory fitted to many classic convertible cars. Usually requires a fitting tool (see below) although can be fitted with a blunt nail on a suitable flat steel surface. Kit consists of ABS die bed and 2 steel punches. 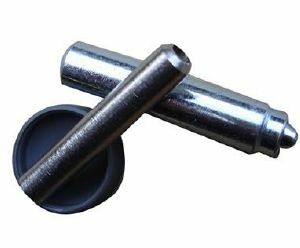 We would recommend this tool to the casual user only (the manufacturer states it is semi-disposable and can be utilised to fit up to 100 poppers only) as it has the ABS plastic, not steel, bed will not last indefinately. Drop forged all steel tool for fitting Durable Dot (popper) fasteners. Consists of double ended punch and die bed. This expensive tool carries a lifetime warranty and is suitable for the professional user.